WesSpur stocks Felco hand pruners. Scroll down for loppers and hedge shears. Felco hand pruners are the standard for quality and performance. Swiss manufactured, all Felco pruners feature comfortable lightweight handles made of forged aluminum and high quality hardened steel blades. The original Felco design has remained unchanged for over forty years. Solid-forged metal alloy handles are complemented by precision made hardened cutting blade and an anvil blade with a sap groove. Hardened bolt and nut assure exact adjustment of both blades. The Felco F2 pruner is the classic Felco design. Features comfortable pruner handle, hardened steel blades, great feel and weight in the hand, and precision manufacturing. A great tool that regularly sees decades of service. Right-handed. The Felco F6 pruner is a compact version of the classic/standard Felco design. This pruner is better for working in tight spaces or for carrying on a packed tool belt. Features comfortable pruner handle, hardened steel blades, great feel and weight in the hand, and precision manufacturing. A great tool that regularly sees decades of service. Right-handed. The Felco F7 pruner has a rotating lower handle so that the pruner always fits comfortably in the hand even when held at extreme angles. This ensures the greatest cutting power. Hardened steel blades, great feel and weight in the hand, and precision manufacturing. A great tool that regularly sees decades of service. Right-handed. The Felco F8 has a redesigned handle for ergonomic pruning. Hardened steel blades, great feel and weight in the hand, and precision manufacturing. A great tool that regularly sees decades of service. Right-handed. The Felco F9 is the left-hand version of the classic pruner design. Features comfortable pruner handle, hardened steel blades, great feel and weight in the hand, and precision manufacturing. A great tool that regularly sees decades of service. Left-handed. The Felco F10 pruner has a rotating lower handle so that the pruner always fits comfortably in the hand even when held at extreme angles. This ensures the greatest cutting power. Hardened steel blades, great feel and weight in the hand, and precision manufacturing. A great tool that regularly sees decades of service. Left-handed. 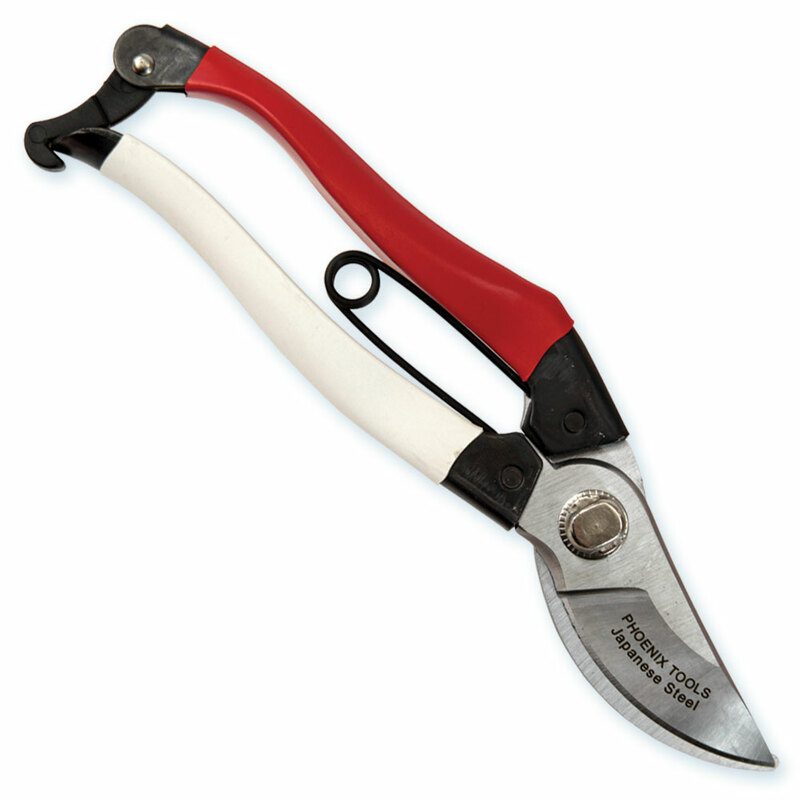 "Red & White" Phoneix 3/4" cut hand-pruner from Spyder. The blade and anvil are forged from high-carbon, tempered Japanese steel. This inexpensive, no-frills hand pruner cuts smoothely and precisely, with an excellent edge. Rounded handle and ergonomic grip, with replaceable V spring. This handy pruner is a homeowner-grade pruner from Corona. Ideal for work around the house. Replaceable parts, comfortable molded rubber handles. Right-handed. We stock Felco blades and replacement springs in our warehouse, and are happy to order any replacement parts for your Felco Pruners. Click below to open a window from the Felco website where you can select your model, and then go to the ”Spare Parts” tab for the official parts diagrams and part numbers (reference the Felco part #s when you call to order). Redesigned in 2011 for improved performance with larger cutting capacity and stronger, lighter handles. This is the lopper of choice for many professional landscapers. For the serious landscaper. Constructed with a blade forged for unsurpassed durability, then precision ground to a knife-like edge. The cutting blade is fully heat treated and re-sharpenable. Backed by a Marvin lifetime guarantee. Sturdy and lightweight aluminum handles with rubber grips. Replacement bumper for both sizes of Fred Marvin Garden of Eden loppers. Buy just the rubber or he complete bumper with screw, spring, plunger and rubber combined. Sold individually. Ultra-lightweight carbon fiber handles make these two-handed pruners a dream to use. The blade is hardened steel with the slimline cutting profile for a clean, precise cut. Shock absorbers built into the handle soften the impact when you complete the cut. All parts are replaceable, so you can keep your favorite pruning tool in use for years. Max cut of up to 1.4 inches. Weighs only 24oz and comes in at 23.6” overall length. The ARS long reach pruner is a great tool for fine pruning. Allows extra reach and great precision. Lightweight aluminum frame with a revolving arm that allows you to change the angle of attack with your wrist. The blades are sharp and durable thanks to ARS advanced cutlery technology. Hard chrome plated blades resist rust and corrosion.